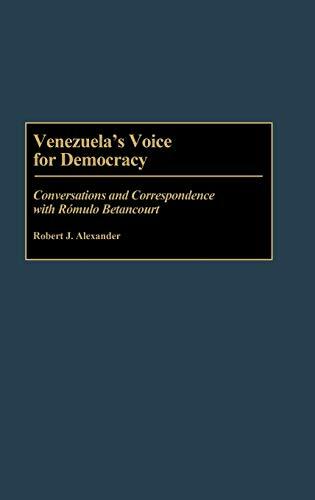 Venezuela's most important political figure of the twentieth century, and probably its most important since Simon Bolivar, is the subject of this volume of interviews and letters. Romulo Betancourt helped to form Venezuela's historic Accion Democratica group, twice served as his country's president, and in his many years in exile worked to inform the world about the political crises and dictatorships that plagued Venezuela. The material in this book covers more than three decades of exchanges between Betancourt and Robert Alexander, presenting details of Betancourt's career and the evolution of his thinking. The material begins with Alexander's first meeting with Betancourt, in 1948, and continues up until the political leader's death forty years later. The interviews and personal exchanges, which Alexander transcribed from notes immediately following each meeting, focus largely on issues and events contemporary to the time of the conversations. In later years, however, when Alexander was compiling a biography of Betancourt, the conversations are directed toward the leader's earlier career, and provide an overview of the events and ideas that shaped Venezuela's political destiny. The letters from Betancourt are reproduced in full, and follow the same pattern of addressing contemporary and, later, biographical issues. This collection will serve as a complementary volume to Robert Alexander's two previous works on Romulo Betancourt, and will be an important resource for courses on the history, politics, and economic development of Latin America and Venezuela. Both public and academic libraries will also find it to be a valuable addition to their collections.